Robotics software for k12 and ks3 computing curriculum.. Explore how a robotic arm works. Robotics software for the classroom. 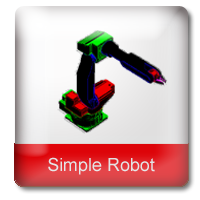 Simple Robot is a simplified version of Interactive Robot. Simple Robot is more suited to primary use. Simple Robot simulates the operation of a robotic arm with all the operating functions of a real robot. Simple Robot brings to the classroom an easy to use interface with a realistic 3D graphical robotic arm at an affordable price. 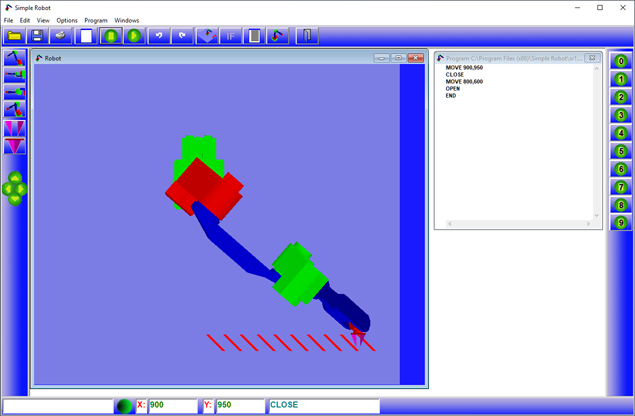 This program is useful to demonstrate the principles behind a robotic moving arm and enable students to write control programs that pick up items in the robots gripper and move them. The student Controls the robot by clicking on icons that move the arm up or down, left or right. A single click on an icon will move the arm to pickup an item. Simple Robots ease of use enables young students to understand the simple principles of robotics. The arm will pickup objects with a single click, this simplifies the process of using the arm. The next step is to write a control program which uses simple commands like UP, DOWN, LEFT 10, RIGHT 5. These commands enable a program to be written to control the picking up and moving of objects. With Windows XP/VISTA/7/8/10 and OpenGL.